In the market for a new or upgraded windrower? Let us introduce you to the new 2019 Massey Ferguson 9960 Windrower. The 2019 Windrower 9960 has new features that will make your long days in the field a whole lot more productive and comfortable. For starters, the standard seat is now a Grammer cloth seat. 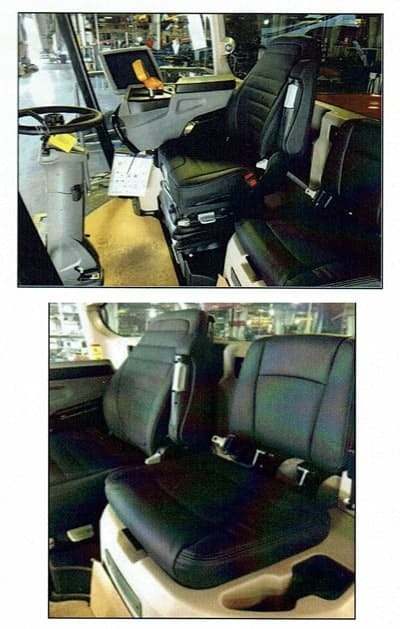 But if you want maximum comfort, upgrade to the new leather seat. It features a lumbar support and seat depth/tilt adjustments to reduce pressure on the backs of knees. A semi-active air-suspension moves the seat side-to-side, plus fore and aft. You’ll appreciate the smooth ride, especially at faster field speeds, on pivots and along borders, or in rough field conditions. The Cabin Comfort Coil Spring System now comes as standard suspension. Each coil can be adjusted for individualized comfort. Just use a standard spanner wrench to turn the lower collar and increase the spring tension. And it can be even more comfortable! Choose the optional Cabin Comfort Air Ride System, where airbags replace the four coil springs. It's built on the same structural design as the coil spring system. But Air Ride doesn't bounce back as hard as springs, so the ride is smoother. Three of the four airbags are equipped with internal leveling; the right front airbag is a slave to the left front. That prevents the cab from continuous movement and swaying. The most recognizable update may be the vision cab. It is unmatched for visibility. Between comfort and visibility enhancements, you’ll experience less fatigue and greater productivity, no matter how long your day in the field lasts. The 9960 comes with GlideRide ™ rear axle suspension, with two gas shocks and a spring providing the suspension. The machine can handle pivot tracks and irrigation borders, and will produce an optimal amount of travel time. Best of all, it’s maintenance free, with no adjustments needed. Increases operator comfort and gives smooth ride that leads to increase ground speed for enhanced productivity. Tough crops and rough terrains? Easily conquered with the Tier 4 Final AGCO Power turbo charged 4 cylinder, 197 HP diesel engine. And with a completely new hydraulics system, the machine transfers more available power from the engine to the header and ground drives. You truly benefit from the increased HP, too. The 9960 is capable of running disc and sickle hay headers, as well as 5400 draper headers. These engines are built exclusively for agricultural applications, and are tuned for optimum performance. Massey has improved the header flotation, building in larger header lift cylinders and two additional accumulators. This new configuration simplifies the process of setting flotation and making adjustments when swapping between headers. A new, programmable FNR (hydro) handle means increased operator convenience. The handle can be customized with up to 16 different functions. Now you can set your own preferences for button locations and general machine functions. This feature has never been seen before on a self-propelled windrower. Additionally, the software has been enhanced for better performance. An updated user interface gives the operator a clear and intuitive view and control of machine functions. You will able to precisely manage your machine speed with OptCruise (tm), and optimize your cutting speed with the Auto Load Control. The V-Cool ™ System sits the cooling components facing outside, rather than stacked. Cool, fresh air is drawn in through the radiator. Warm air is not transferred from one radiator to the next. Also, the hydraulically driven cooling fan turns only when conditions demand it, freeing up extra HP for other uses. The system auto-reverses every fifteen minutes, keeping radiator and intake screens debris-free. This system is maintenance free. The machine’s industry exclusive rear steer option comes with selectable engagement for transport mode. Rear caster wheels are controlled by hydraulic cylinders, providing positive hydraulic rear steering control. Front drive wheels lock together like a differential. Add to that the simple and intuitive combine-like steering. A slow speed transport kit can tow a 5400 draper head. Ask us about the other kits recommended or required for this unit. The dual header drive motors have been increased to 56cc on 16’ disc headers. And the conditioner gearboxes can handle increased power flow through the header. That means increased service life, even in tough conditions. A new design lets the operator adjust the roll tension adjustment in cab. And new 3 C Section drive belts have replaced the 4 A Section belt. This means an increase in belt strength and a larger surface contact area with the pulleys. The cutter bar cages have been improved to withstand the abuse of heavy crop conditions, and a quick attach top link receiver helps simplify header attachment and removal. The RazorBar ™ is the strongest, most durable cutter bar in the industry. It has a spur gear design, and 2.5 tooth-to-tooth drive contact at all times. Each gear assembly and adjacent idler gear can be removed individually, with disassembling the cutter bar. You’ll see closer cutting and less scalping with its new thin profile. And it comes with a 3 year factory warranty. 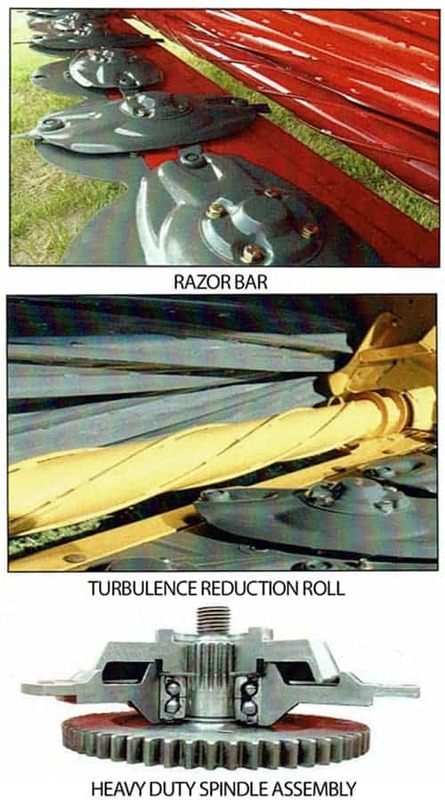 Another feature worth noting is the turbulence reduction roll that keeps the crop standing tall before cutting. 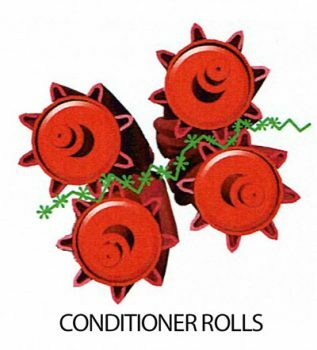 It also provides lifting action, assisting the crop into the conditioner rolls. You’ll appreciate the improved cut quality and maximum capacity. And with the heavy duty spindle assembly, there’s no need for extra shear protection. If a spindle should shear, it can easily be replaced without splitting the cutter bar. Sealed bearings and anti-wrap hub reduce maintenance and help add longer component lifetime. You’ll appreciate the new accumulator protection that blocks foreign objects. It’s easily adjusted through the cab terminal. And if you do need to reverse the header to clear a plug, the hydraulic roll pressure automatically dumps, then is automatically reapplied when the header is returned to normal operation. The sickle header comes with hydraulic reel drive options that allow reel speed to be controlled separately from other constant header speeds. It’s never been easier to match your speed to conditions as they change. These hydraulic reel drives come with dual hydraulic hookups. (Mechanical reel drives use a single hookup.) Single point couplers are available to make removal and attachments quicker and simpler. Plus, the new heavier-duty reels promote smooth and consistent crop flow through the header. They are built with additional reel spiders that resist bending in heavy crop conditions. Another heavy duty enhancement are the long tang sickle guards that improve performance in down or green crops. They also have more power to penetrate dense crops. And if plugs happen? The auger slip clutch has been redesigned to ratchet, rather than slip, when encountering a plug. This change adds maximum life to the part.